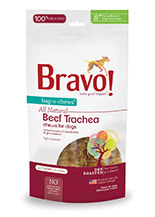 Bag-O-Chews® – handy snacks for healthy chewing. 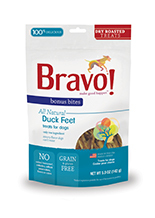 Bravo offers a variety of all-natural chews so parents can provide their pets with a safe, healthy, grain free treat. 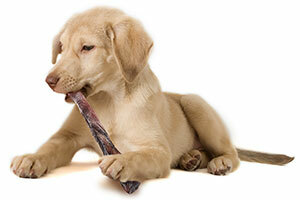 A “good chew” helps keep your pet’s teeth clean, helps promote gum strength and reduce stress. For your complete peace of mind, these dry-roasted chews are USA sourced and made. AND they're good for them! In the wild, cats regularly crunch the small bones in the prey they feed on. This is how nature keeps their gums healthy and their teeth clean. But the typical housecat doesn’t get or accept any kind of “chew”. 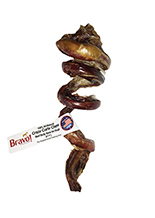 Our dry roasted duck feet are changing that. About 50% of cats LOVE our duck feet and are reaping both the psychological and dental benefits provided by the natural behaviors of tearing and crunching. 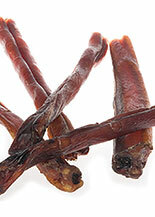 Duck feet – a treat Making Healthy Happen!